The Bosch PR20EVS Colt electronic variable-speed palm router combines power, precision and versatility in a small-sized tool. It has a 1.0 HP, 5.6 Amp motor that spins at a variable speed of 16,000 to 35,000 RPM. The router features Constant Response circuitry, which maintains a consistent speed by detecting heavy loads and increasing power to maintain the selected RPM. It features soft-start circuitry, which reduces startup torque. Additionally, depth adjustment is simple; just align and lower the motor and then lock the router in position with the clamping level. Micro-fine adjustments are equally effortless, thanks to the wheel on the back of the router's base. It accepts standard 1/4 inch bits for flexibility, with an impressive max cutter diameter of 1-5/16 inch The motor housing has a palm-shaped, rubber over-molded grip that allows for comfortable operation. And the included rugged aluminum fixed base is durable, solid and precise. The Bosch PR011 plunge base works with PR20EVS and PR10E Colt palm router motor and greatly expands the router's versatility. It features smooth plunge action and spring-lock plunge control lever. The depth adjustment system includes a seven-step adjustable depth stop turret plus microfine adjustment on depth rod for fast, accurate bit depth setting. The precision centering design allows the sub base to be Afterlock around the bit, which makes it easy to keep the bit on intended outline when using jigs, templets, dovetail fixtures and similar guidance devices. The PR011 plunge accepts several different Bosch routing attachments, including the RA1126 tool-free Templet guide adapter, RA1054 deluxe router guide and PR012 dust hood. Bosch power tools are painstakingly engineered to survive any job site, and let you take control of your work, big project or small. Bosch tools set the standard for quality, innovation, and dependability. In fact, professionals have trusted them enough to stake their reputation on Bosch performance for years. Bosch Invented for Life. Add a decorative edge to your woodwork projects with this router bit. Freud's precision ground carbide bits have a grain size smaller than other grades and titanium is added making them more impervious to chemical attack. Promoting safer woodworking is the reason Freud made a commitment to develop anti-kickback router bits. 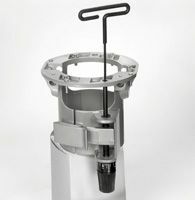 Bits are computer balanced to insure vibration-free operation at speeds that are a safe margin above the typical 22,000 rpm of most routers. Router Undermount Base The RA1165 under-table base is based on the durable Bosch fixed base but enhanced with an above-table bit height adjustment mechanism. The RA1165 under-table base can be mounted to virtually any table surface and common router table plates. It includes hardware for mounting to router table and an T-wrench for adjusting the depth from above the table. Router Undermount Base is rated 4.8 out of 5 by 22. Rated 5 out of 5 by Eric from Yes! It moves up and down!... Yes! It moves up and down! Rated 5 out of 5 by Buck from If you have a Bosch Router table, this is a no-brainer choice! This way, you don't tie up your Ro... If you have a Bosch Router table, this is a no-brainer choice! This way, you don't tie up your Router Mobile base and it is easy to put the router in and out of this fixed table base. Adjustment from the Table top is easy with the included adjustment key. Rated 4 out of 5 by Namakaman from Works Great! I bought an extra base so that I could easily change from router table to straight router. It lets me do exactly that.I leave one base on the router table all the time and have another to slide the motor into when I want a regular router. One step, no tool change over. Rated 5 out of 5 by Charles from This was an excellent purchase. I’m certain that this will serve me well for years to come ! This was an excellent purchase. I’m certain that this will serve me well for years to come ! Rated 5 out of 5 by Jimbo from Attached to my new router table and everything works great.... Attached to my new router table and everything works great. Rated 5 out of 5 by WingedHussar from I purchased this router lift to replace the fixed router... I purchased this router lift to replace the fixed router base that came with my Bosch router. Mounting this new device was very easy and inserting the router motor into the table no longer requires tools and is quick. Saves a lot of time. Router bit height is adjustable above the table. Rated 5 out of 5 by HomeDepotCustomer from I have returned it because I do not need it... I have returned it because I do not need it but it's a great add-on. Will this work with a 3.5 inch diameter router motor? Thank you for your question. The RA1165 Router Under-mount Base is designed for 1617/1618-Series Router Motors. For further assistance, contact us at 1-877-BOSCH99 (1-877-267-2499) from Mon-Fri 7A-7P CST.